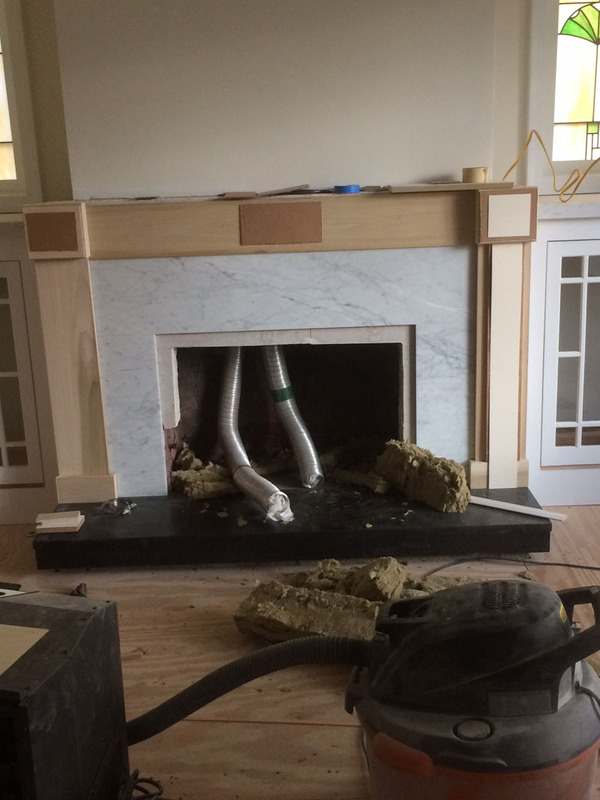 If I’m going to have a roaring fire in this thing by Christmas, I better get a move on finishing the surround. 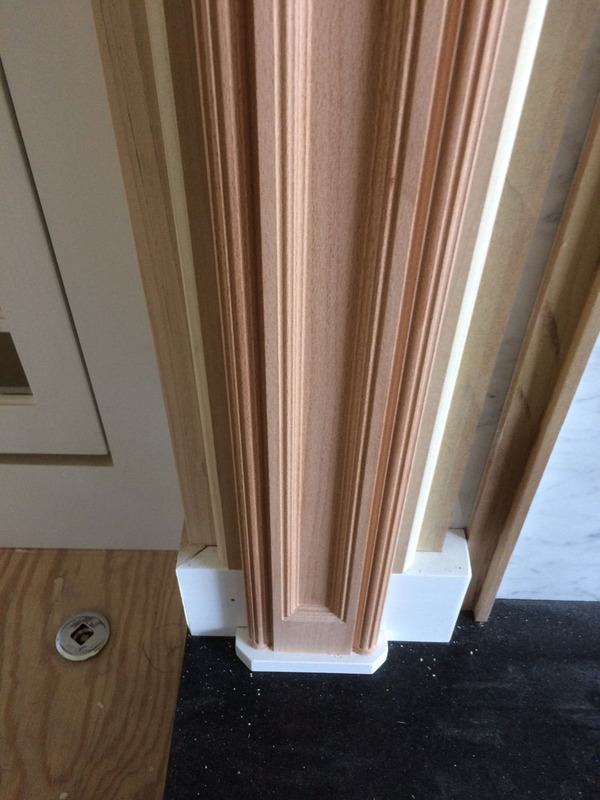 I added small extension blocks to the tops of the pilasters to create some depth and add some dimension. 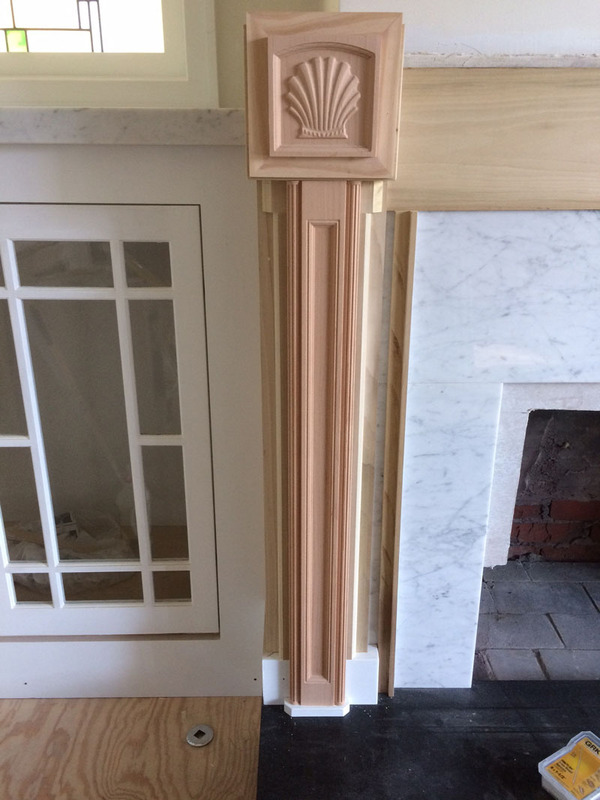 The pilasters are just press fitted to the side pieces that have been attached to the fireplace. 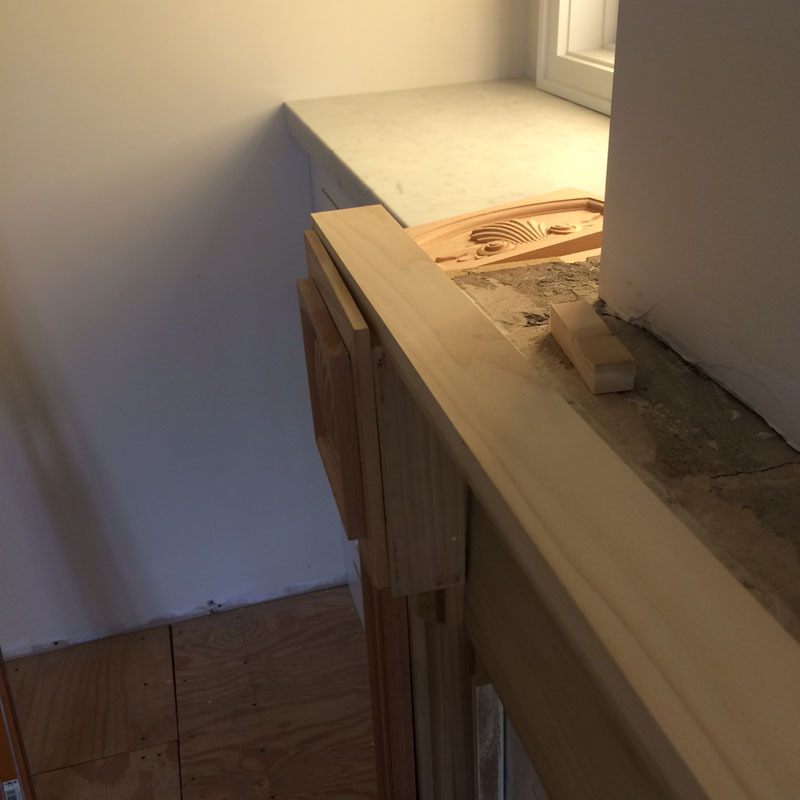 The crosspiece is not installed. 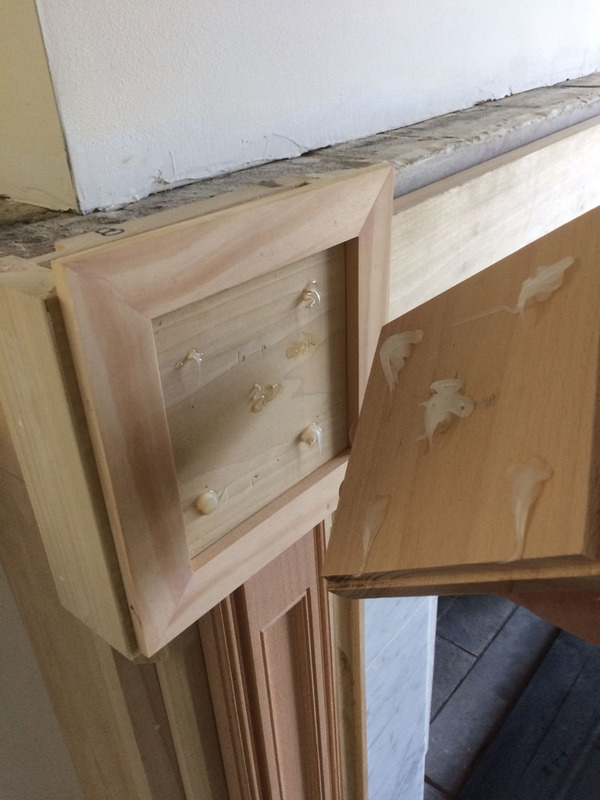 A little silicone is used to attach the carved corner decorations to the corner boxes. Again, I used silicone in case I had to pry these puppies off and keep damage to a minimum. 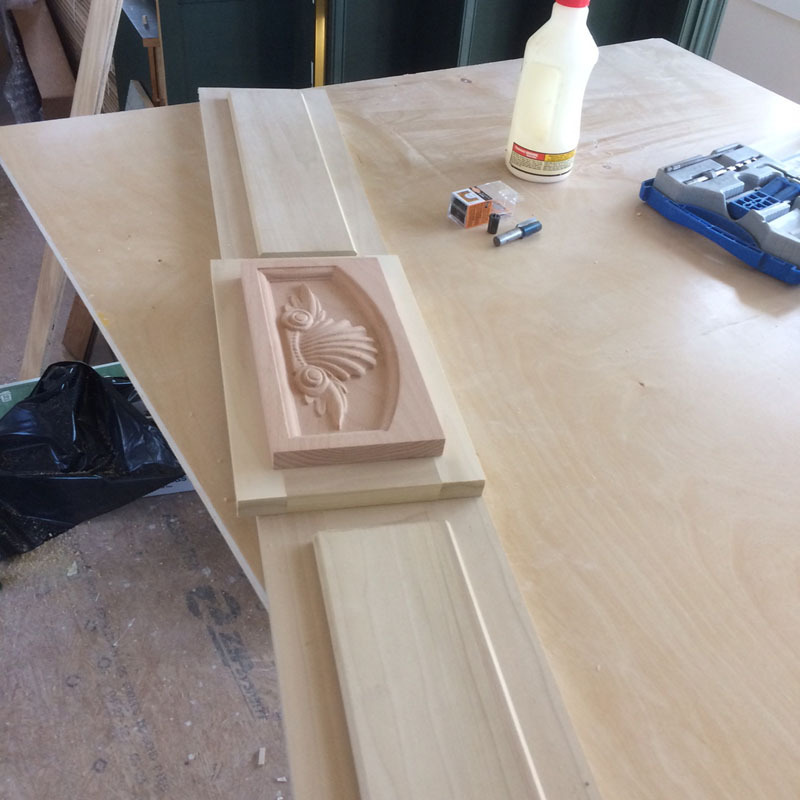 I added a small foot to the base of the carved facing pilaster. 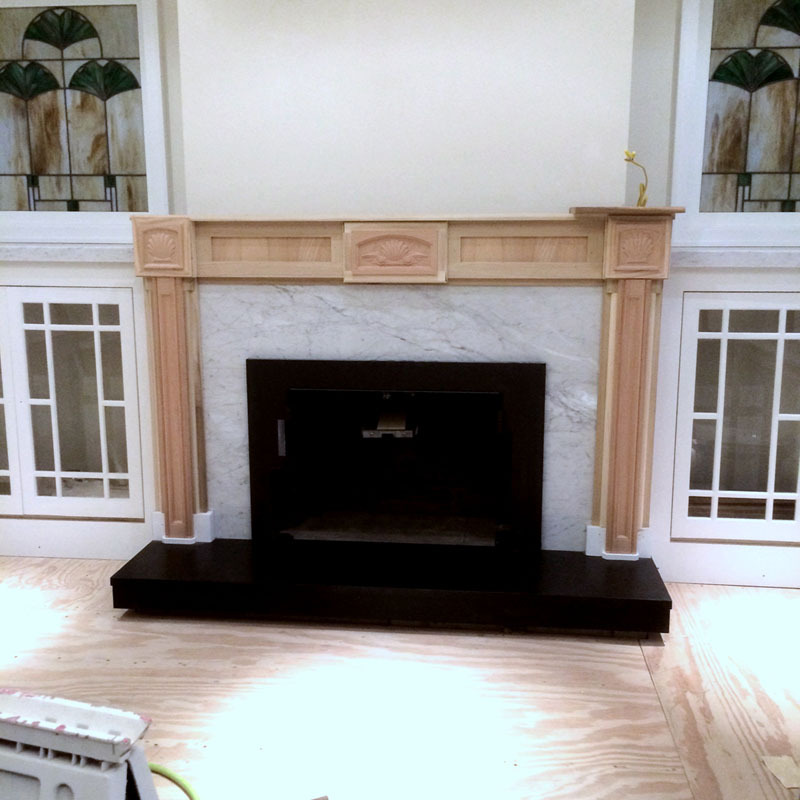 Behind the ornamental element is another piece with a bevel cut to match the foot. The base is pre-painted to make final finishing easier. 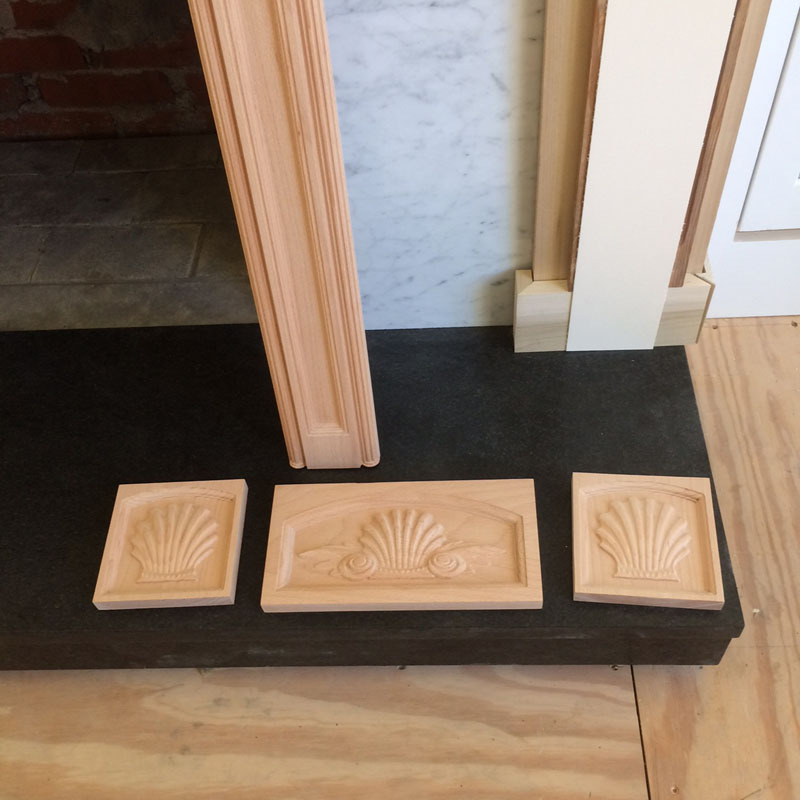 All the design elements are in place for the pilasters. 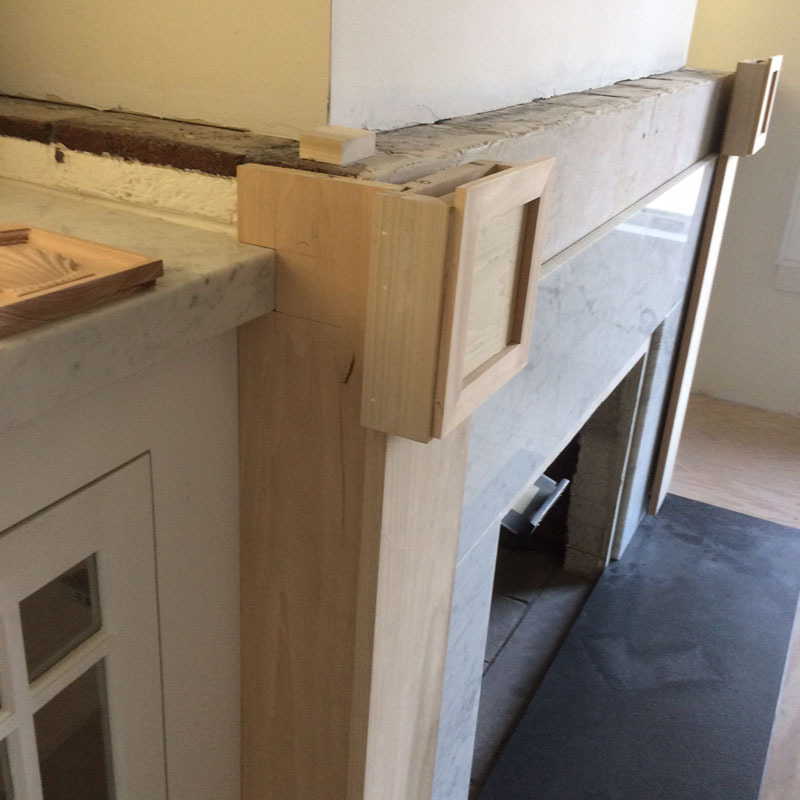 The floating crosspiece is slipped in and two scrap sticks are used to keep it in position. Here’s where those floating front pieces come into play. 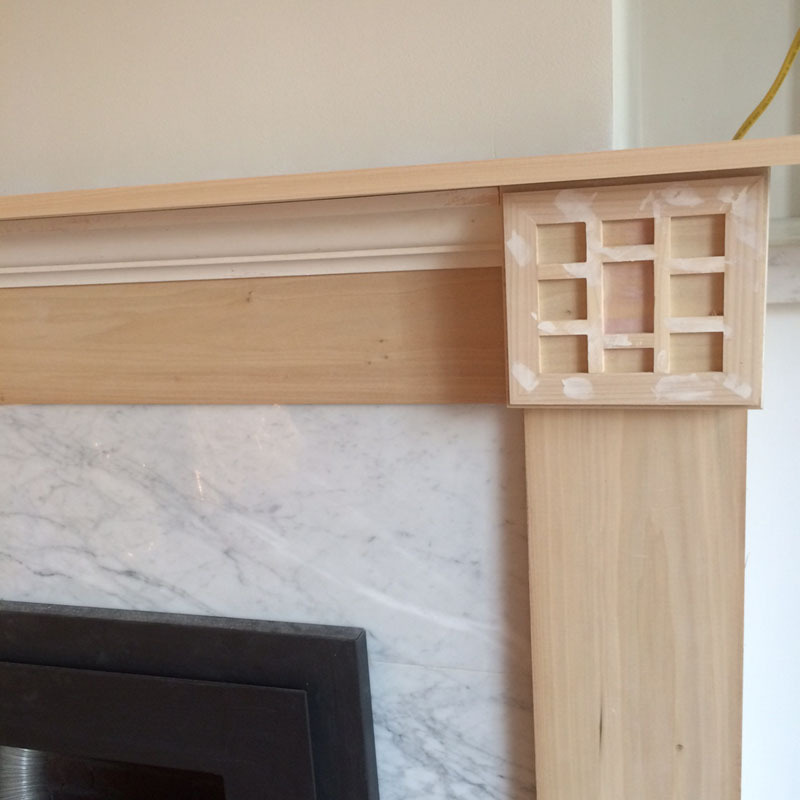 The top crosspiece shows how crooked the face of the pilaster is in relation to the fireplace front at the top. 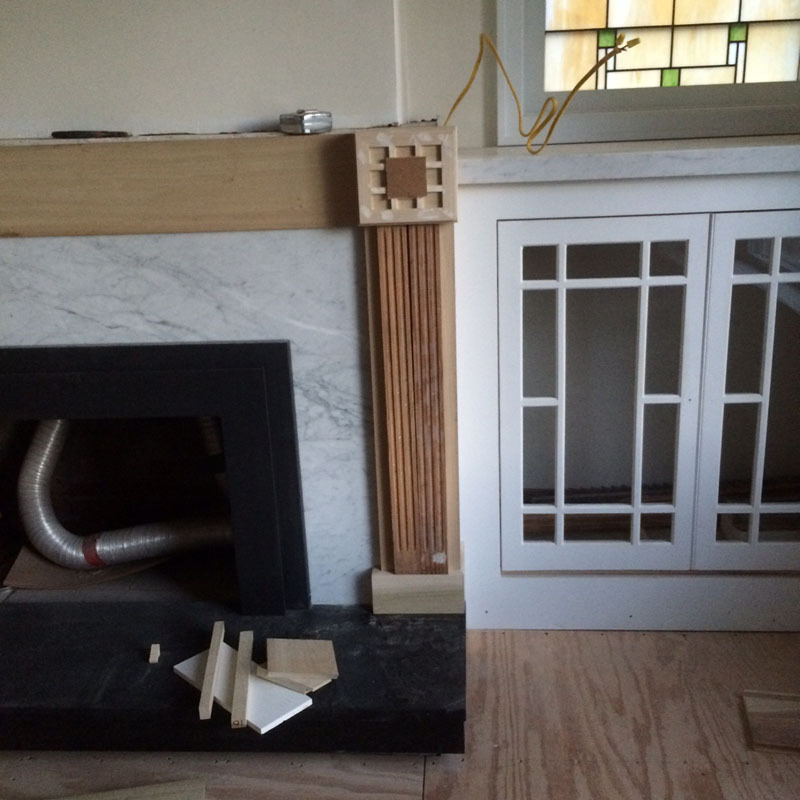 The base of this pilaster is flush to the fireplace – pretty skewed. 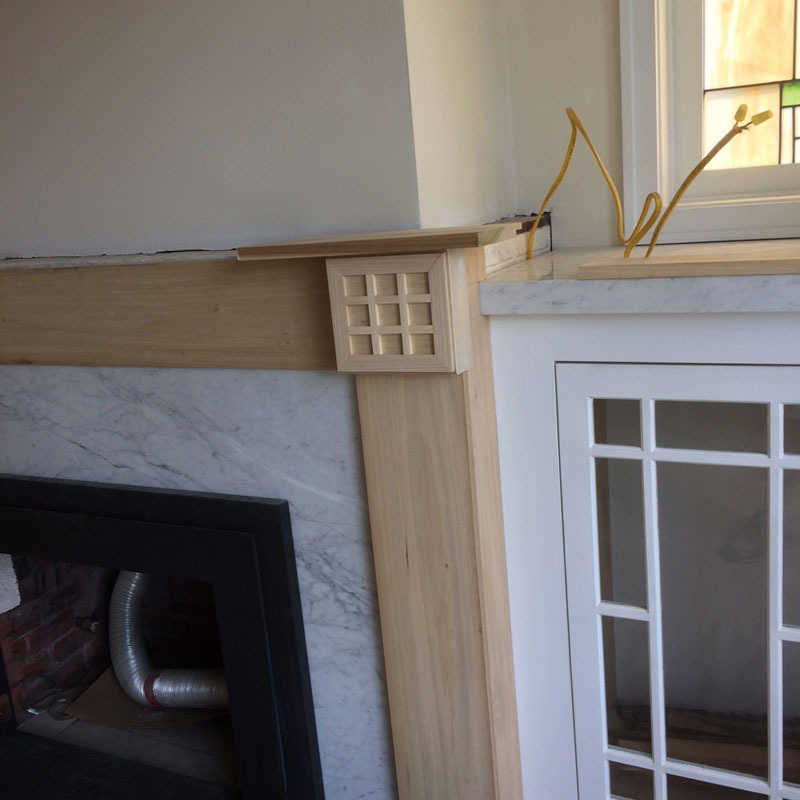 Because we didn’t attach the front piece to the side we can pivot this just a little to square the face to the front of the fireplace. 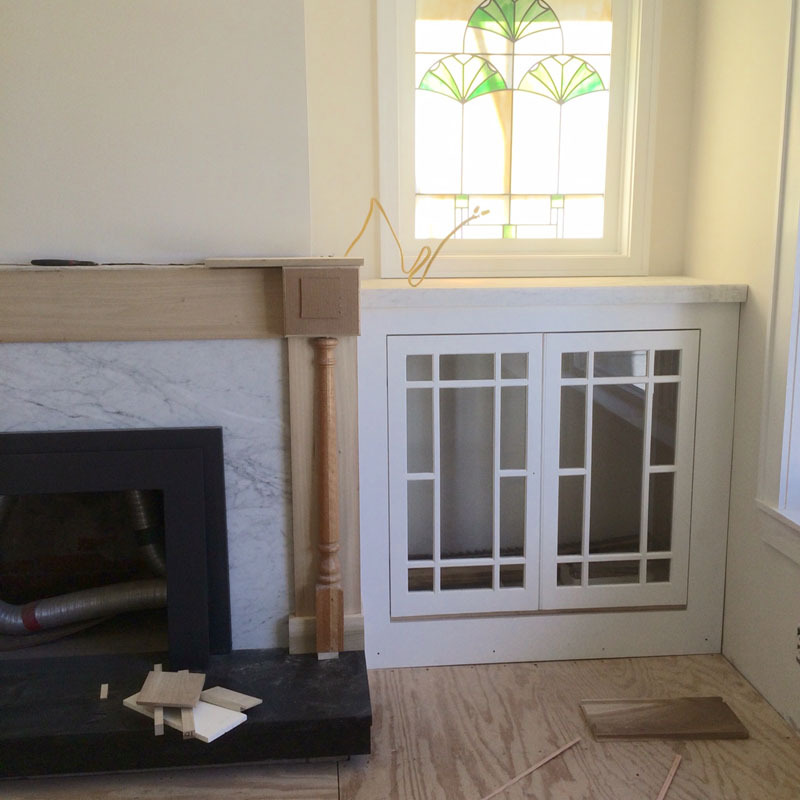 Since the fireplace is a little skewed you can see the top is slightly out of the bottom of the dado. 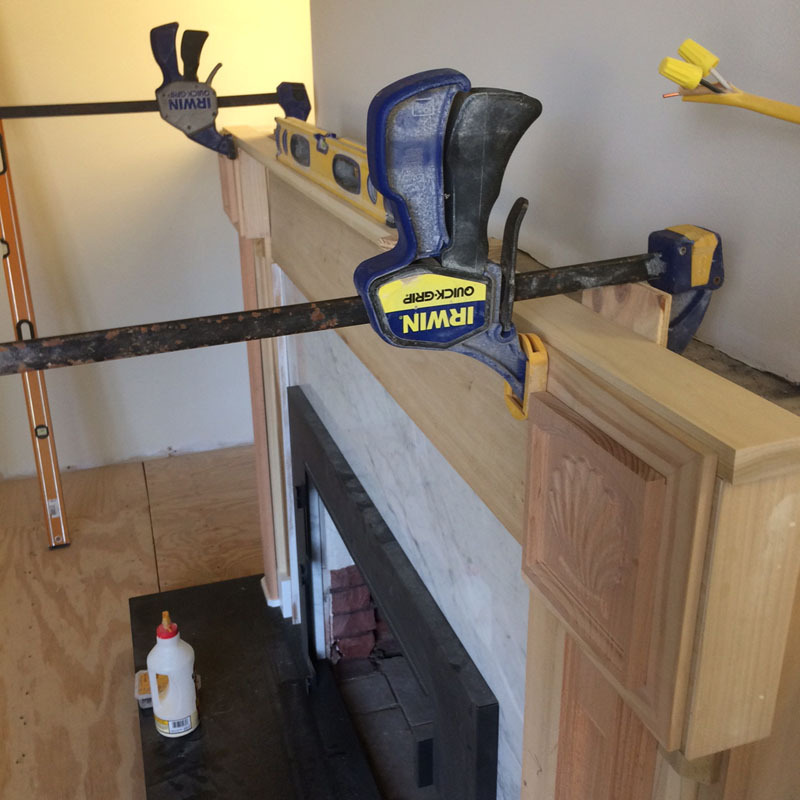 By clamping and attaching the top crosspiece to the pilasters we can tighten the legs and remove any gaps between the pilasters and fireplace. The lower crosspiece is still not attached. Make sense? Now we can make the crosspiece overlay. This will be mounted to the main face crosspiece that has yet to be permanently attached. 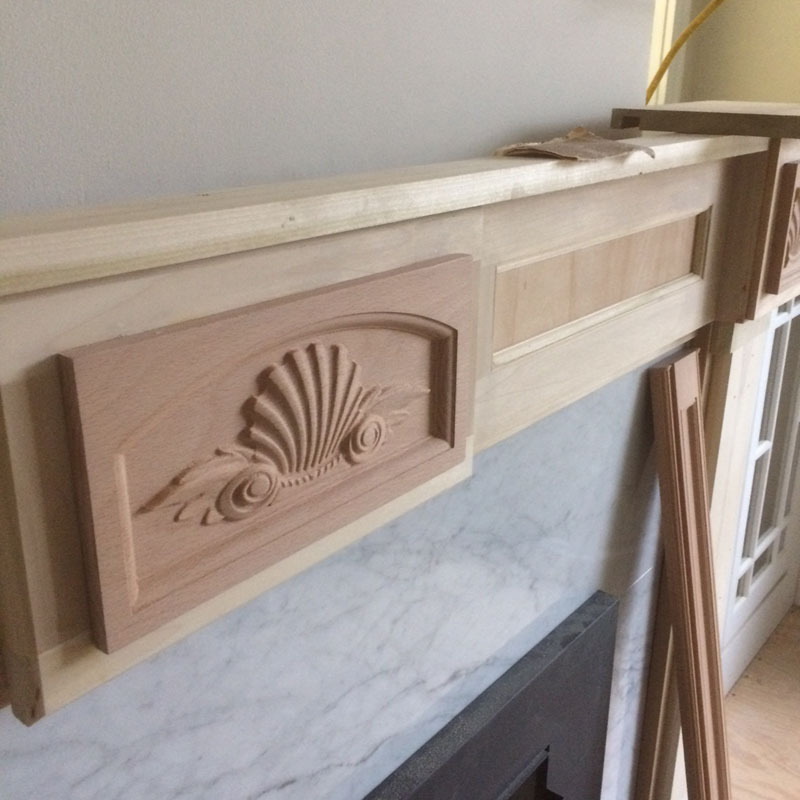 The piece is constructed to frame the center carving and have two side elements. 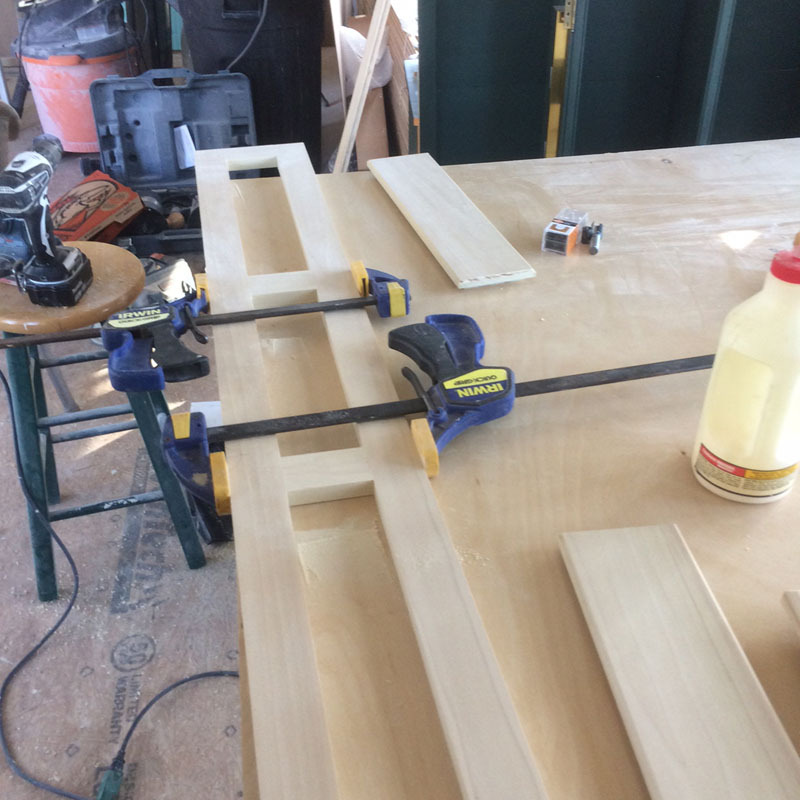 I originally thought I would have two raised panels, but didn’t like the design. 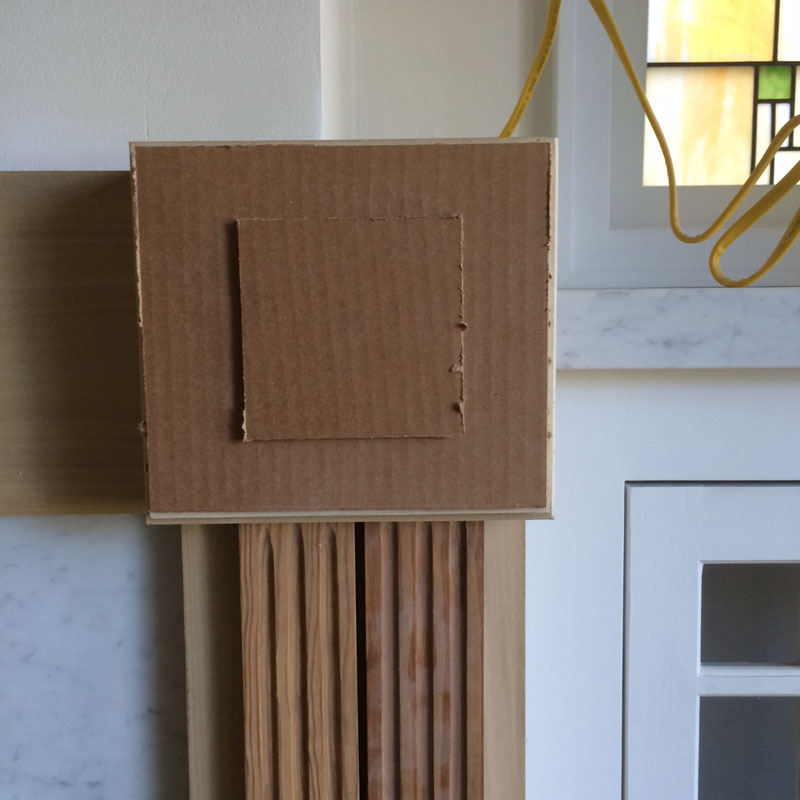 The crosspiece frame we just made is attached to the floating crosspiece. 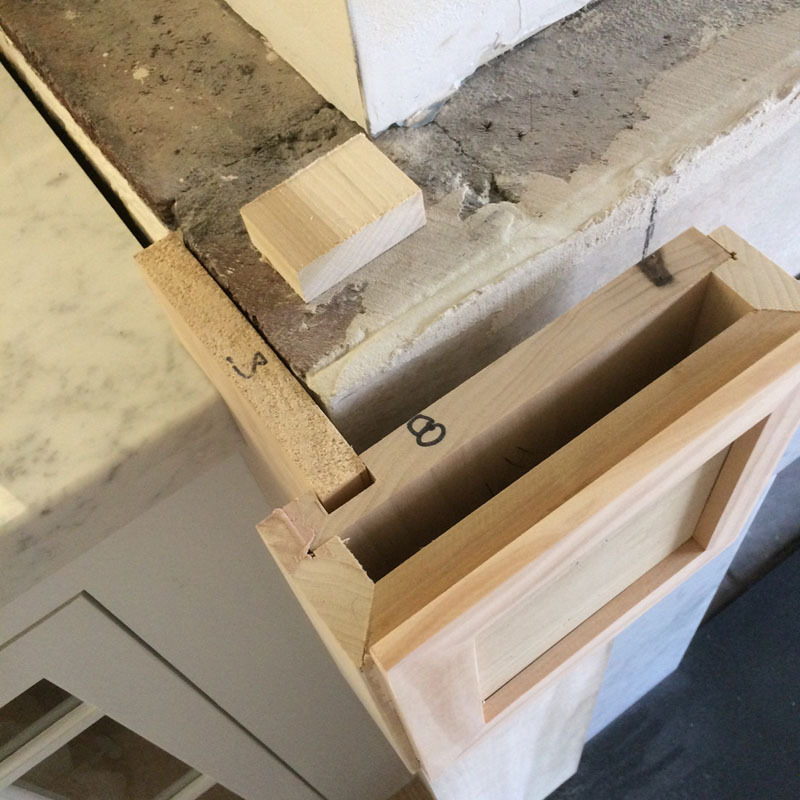 The frame is then attached to the top piece that bridges the pilasters. Only now are all the elements attached to each other. That’s a lot of steps to put three sticks together. 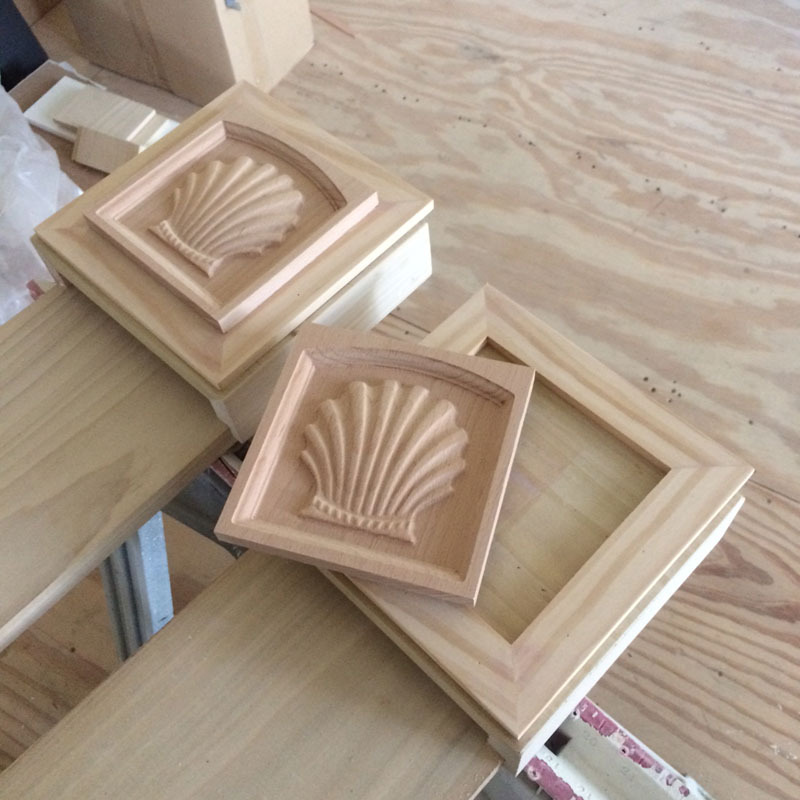 Since we made recessed panels on either side of the center carving, we need to add the same detail to the recessed edge that the carvings have. 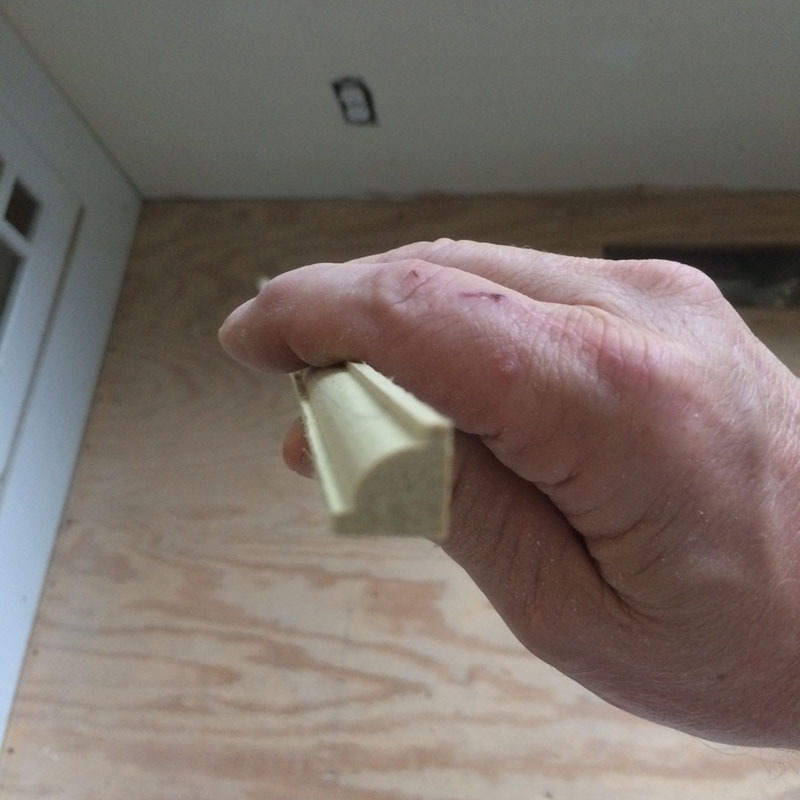 A small router bit created the profile and then two trips through the table saw makes the proper shape. 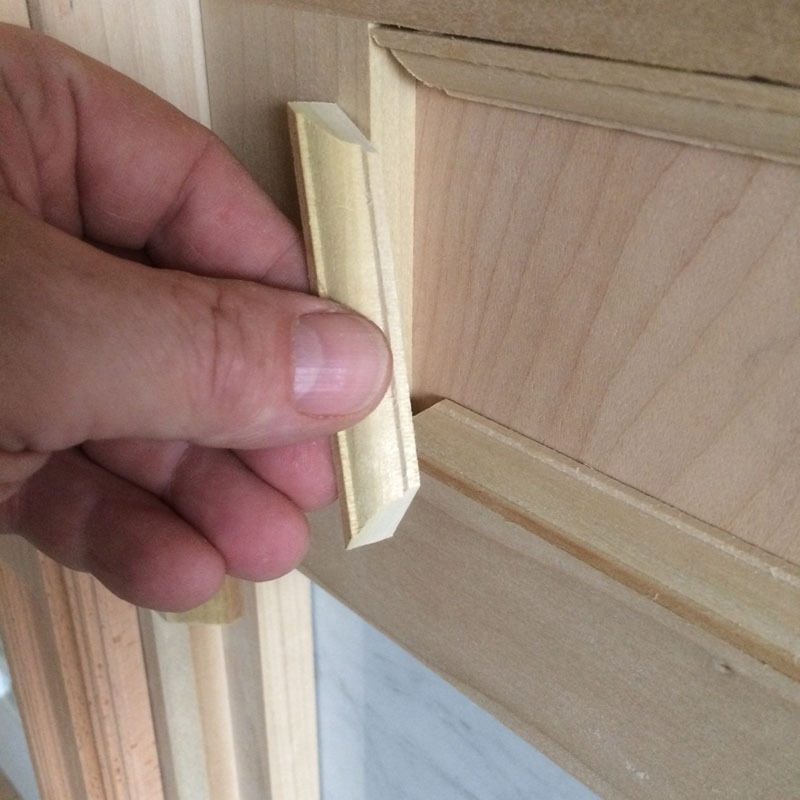 The pieces are cut and fitted to the inside of the recess. 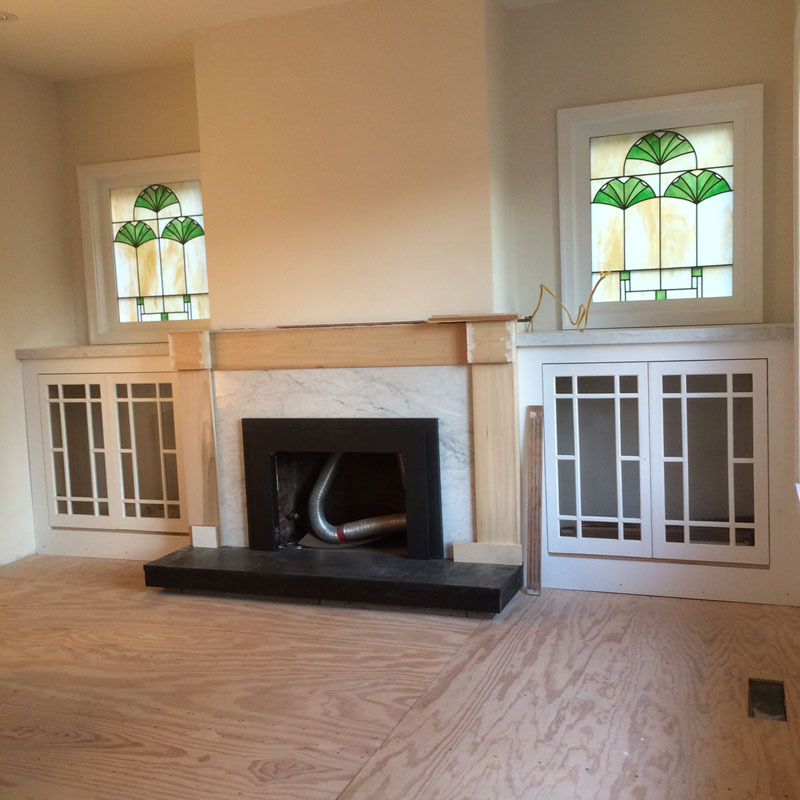 Now the recessed panels match the carvings. One more post and we’ll be on to the next – come along – it’s getting interesting.